Getting rid of wrinkles and fine lines is a central focus for women with signs of aging. If the prescription wrinkle creams such as Retin A and Renova are not potent enough to remove the wrinkles, it may be time for you to opt for a laser skin tightening treatment. In 2005, over 10 million Surgical and non-surgical wrinkle removal procedures took place. Of those ten million, over 80% were non-surgical. Surgical procedures like facelifts are quickly facing out and non-invasive options to achieve youthful skin have become the quickest growing wrinkle removal procedure today. Several cosmetic surgeries claim to reduce the look of wrinkles; nonetheless, technological advancements have made a particular treatment procedure to exceed other cosmetic procedures in being the most precise, safest, and effective at diminishing the appearance of wrinkles – Laser Skin Tightening. This treatment for skin tightening is evolving and they are controlled and administered by experienced practitioners. 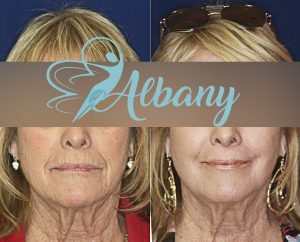 This procedure is slightly invasive; it makes use of a laser to smoothen fine lines.That heats up the collagen underneath the facial skin; this process causes the skin to tighten. Skin tightening is visible moments after the procedure, making this treatment a well-known procedure. Furthermore, skin tightening goes on for few months; however, best results normally take 2 or 3 procedures with a month interval. In contrast to chemical peels which damage the skin, lasers heat the skin layers. Using heat makes the skin tissue to tighten and accelerates the production of collagen which makes the facial skin firmer and youthful. As a result, people who use lasers for smoothing out fine lines and wrinkles enjoy great results. One of the many advantages of laser for skin tightening is that lasers are effective and safe for rejuvenating the skin for a more youthful and firm appearance. This is an invasive procedure for the diminishing wrinkles and fine lines. During this procedure, there is a visible injury on the facial skin as a result of the heat from the laser, so a patient needs approximately three weeks to recover completely. This treatment is perfect for people with deep fine lines, wrinkles, and sun damage. This procedure offers an enhanced rejuvenation. With fractional rejuvenation, wrinkles can be reduced greatly with a prolonged recovery time. Those who want to avoid the dangers and recovery period of ablative laser resurfacing but require skin tightening often go for fractional rejuvenation. The need for less risky treatments has resulted in an increased interest in this type of laser procedure. This is the mildest type of laser treatments. Non-ablative skin laser procedures work best on early-stage fine lines and wrinkles. This type of wrinkle removal procedure needs no time of recovery. This treatment also promotes the developments of collagen in the parts where the laser is applied; it also stimulates the absorption of collagen from other untreated parts of the skin. As natural collagen is regenerated, laser tightening patients notice a softer and smoother skin. The doctor will apply an anesthetic cream on the area that will be treated to reduce any uneasiness. Afterward, a pulse of laser is used to target the wrinkled areas. During the treatments, the patient will experience a minor heating sensation. This discomfort is reduced by the cooling gust of air emitted by the laser handpiece; the air improves comfort and prevents the skin from burning. 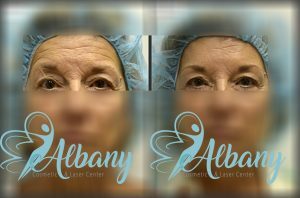 It takes approximately one hour for a session, although, the time frame is determined by how prominent the wrinkles are and the area being treated. Every skin tightening procedure is painless and short, thus patients can go on with their usual activities after the treatment. There will be no visible and aggravated injury after a treatment compares to other treatments like chemical peels which causes visible injury to the face and an excruciating pain when applied. Apart from ablative treatments, laser procedures require minimal recovery time. Most people witness a visual decrease in fine lines and wrinkles after one session, and some require several procedures for a period of 6 months during which noticeable changes occur. Another advantage of using lasers treatments is that the aftereffects are rare. However, there might be some visible soreness or swelling but the frequently seen skin reaction is mild redness in the laser treated area. The area can be covered with Makeup and it is also important to apply sunscreen on the areas after a laser treatment. There are minor risks connected with this procedure, nonetheless, it is vital to seek the service of an experienced doctor. People prone to acne and herpes should seek medical advice before undergoing such treatment. Pregnant women are advised not to receive laser treatments and patients prone to keloids and reactions to this treatment should seek medical advice from a doctor before any procedure. Tightening the skin using lasers is safe for women and men with different skin tones. It is for healthy individuals who desire a more youthful skin. The side effects or skin reactions are short-term, this includes skin color, stinging, and bruising on the treated areas, however, these side effects rapidly subside. How expensive is a lasers skin treatment? The cost for a laser tightening procedure differs according to several factors. The location of the laser practitioner’s office and level of skill may affect the price of the procedure. Also, the cost of this procedure is dependent on the state of the person’s facial skin and the kind of laser procedure required for the patient to achieve his/her desired results. The average costs of this treatment range from $400 and $2500 for a complete procedure. Conclusively, Laser tightening is prevalent on the grounds that it is regarded as a better and safe alternative than surgery. It does not require needles and the recovery period is short. If you can afford a laser skin treatment and you completely comprehend the side effects, we will be glad to discuss our lasers skin tightening treatments with you. In 1795 Edmonton was created as a Hudson’s Bay Company post.